I did a video on this a while ago but I think it’s probably quite useful to see the brushes up close and personal. The brushes I use are from various makes but it’s the style of brush that counts…. And the hair quality. 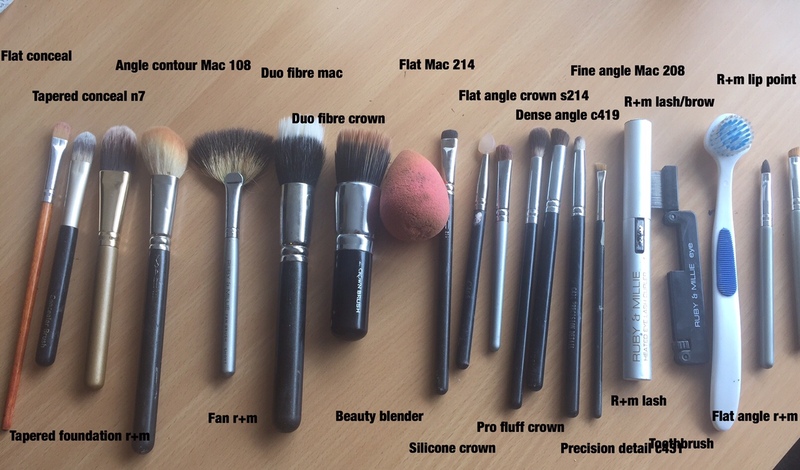 Baring that in mind – I’ve had brushes that have cost me £3.00 which have outshined it’s £30 rivals…. I love MAC but I can honestly say some of there brushes are not the best of quality. Brushes should last a long time, I treat my brushes incredibly well and I expect the handles to stay in tact too – rubbed and cracked off paint is one bugbear with my MAC brushes. 1. Flat concealer brush. (mines generic) Good for concealing, better for neatening brows and lips after they’ve been filled for a very neat finish. Look for a rounded tip or a slight point on flat sides. This brush is also good to draw contour onto the nose. 2. Tapered concealer brush. (Mines No7) Good for under eyes conceal as they’re wide and soft and good for around the nose. Also to draw contour on! 3. Tapered foundation brush. ( Mines ruby&Millie) Good for applying foundation around the face before blending. 4. Angle contour (mines MAC 108) this is good for applying powder contour, and applying blush as the shape is angled good for getting powder around the contours of the face. This brush isn’t a necessity but it’s nice to have it there every now and again. 5. Fan Brush ( mines ruby & Millie) this is my absolute favorite Powder brush. Ideal for sweeping off excess powder or dropped eyeshadow. Amaziiiing for contouring the cheek bones and under the jaw. Unreal for applying highlight to the nose forehead cheekbones and anywhere else. Brilliant for applying bronzer as the colour sweeps and isn’t too heavy! 7. Duo fibre brush ( this ones Crown) Also known as a stipling brush this crown one has MUCH denser hairs than the Mac ones so you don’t get brush strokes when using thicker foundation. 8. Beauty Blender ( beauty blender ! No substitutions! ) this is the absolute number one favorite make up product I’ve ever purchased. I don’t know what I used to do without it! Unlike normal sponges you put this under water so the sponge doubles in size and doesn’t absorb much product, the texture is something I can’t really describe but by bouncing it on the face over foundation and for blending in contour you can’t really beat the HD finish it gives you. You can also use it the apply powder for a baked finish. Word of warning: DO NOT buy a fake or similar version… (eBay etc offer these) They are not the same texture or expansion, and don’t offer the same level of finish! Most are just a normal sponge in a round shape. P.s sorry about the state of mine – you can see it’s well used! A new one is on the way in black this time so it doesn’t show up dark contour make up on it so much! 9. Flat & short (MAC 214) perfect for dabbing on loose pigments and also for smoking out the eye underneath, it can also be used for a more powdery natural finish on the brows, this can also be used for powder contour on the nose of followed with a blended brush. Also good to keep a flat edge on the wing of the eyeshadow. Not a necessity but nice to have. 10. Silicone brush. ( mines crown) this is by far the cleverest little brush ever. It works like a finger for dabbing on loose pigment and glitter for a more concentrated effect. Flat side can be used for larger areas and sides can be used to under the eye etc. so clever! 12. Fluff brush ( mines crown pro fluff brush) this is the number one most important brush for professional looking blended shadow. Also great for blending smaller areas of powder contour eg the nose. Use in light pressure small circular motions to blend in shadows to each other and he skin. 13. Dense angle ( mines crown C419) again not a necessity but nice to have, this creates dense concentrated shadow on the lid and also creates a nice angled shape due to the shaping. 14. Precision pencil ( mines crown precision detail) this is sooooo important for applying smaller areas of shadow eg eye contour or adding a darker shade to the lid, also for smoking underneath the eye. Always follow with a blending / fluff brush. 15. A very find angled brush ( mines MAC 208) this is for the brows and any precision lines, I literally can not recommend this enough. To draw on precision brows it’s by far the best as its so thin! Also great for gel liner and likes…. Make sure you brush is Thin at the end…. Like really really thin! 15. Heated eyelash curler ( mines Ruby+Millie heated eyelash curler). my favorite eyelash curler by a mile, I never really like using normal curlers on the lashes but this is different standard… I have had this for years and just takes aa battery’s. Apply mascara wait to dry then use this , it remelts the product and sets it in the curl, perfect for curling the outside corner lashes and boosting the root for personalized curl. I use it at the base, in the centre and then at the end of the outside lashes only. 16. Brow and lash comb. ( Mines Ruby+ Millie) this is unreal, and I know Real Techniques do a good one also. One side is like a small mascara wand which is perfect for brushing brows up and before trimming… The other side is a metal comb which is such a fine tooth it combs through wet mascara like a dream. Perfect for multi layered mascara or lash primers for no clumps. Avoid plastic brushes and go for the metal! 17. Toothbrush. Perfect for brows and baby hair. Brush brows up and smooth sleek hair , this is a tongue brush so it’s a bit bigger but any will do! 18. Taped lip brush. ( mines Ruby & Millie) Perfect for lips even better for drawing on brush Stoke hairs with brow wax! 19. Angled small brush ( Mines Ruby+Millie) perfect for thick liners but even better for getting angled right with lipstick and a precision finish! 20. kabuki brush ( Mines Ruby + Millie) I use. A small to medium size which is great for powders and mineral foundations. I don’t use a big one as I prefer precision! This is big enough to cover face I a few strokes but small enough to powder eyelids etc. The softness of the hairs means the powder can be concentrated or wash of colour and used in a circular motion for amazing blending! 21. Square lip brush ( mines Ruby + Millie) – mines gone walk abouts but imagine 18 but flat and square. My go to lip brush for getting great shape and good coverage. The square edge is very useful for shaping! Previous Article← St Moritz Shade control Tan!